I've been on the road - on walkabout as the Australians would say - for the last four weeks, doing a number of speaking engagements and trips across America. As we all know, all paths lead back to energy, hence, on my travels I have seen a bunch of energy infrastructure that I normally just study on a screen. Hark, here are some of those places, and some corresponding insights via our ClipperData. A couple of weeks ago I was in Philadelphia. On the way from the airport to the southside of the city, you pass by PES' Philadelphia refinery - the largest refinery on the East Coast with a capacity of 335,000 barrels per day. 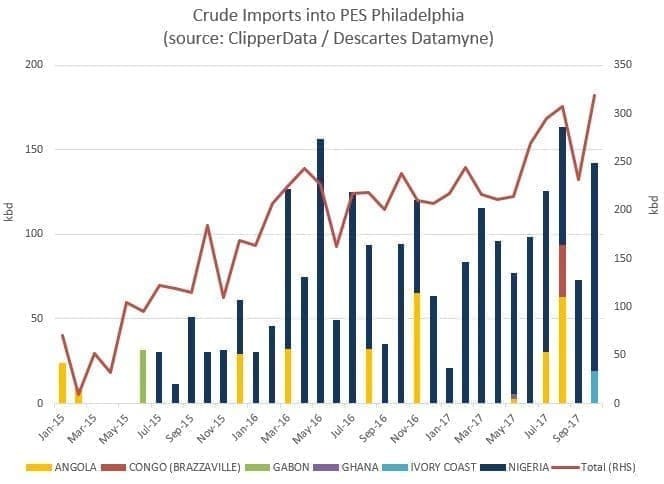 After crude imports to the refinery dropped to zero in early 2015 amid rising domestic production and crude-by-rail deliveries, we have seen a gradual rebound in imports over the last two years, with flows picking up in particular from West Africa. (The refinery is still taking some crude-by-rail deliveries, but not much). In the week following Philadelphia, I had the pleasure of speaking at LSU's Center for Energy Studies Energy Summit, flying over ExxonMobil's 500,000 bpd Baton Rouge refinery - the fourth largest refinery in the country. 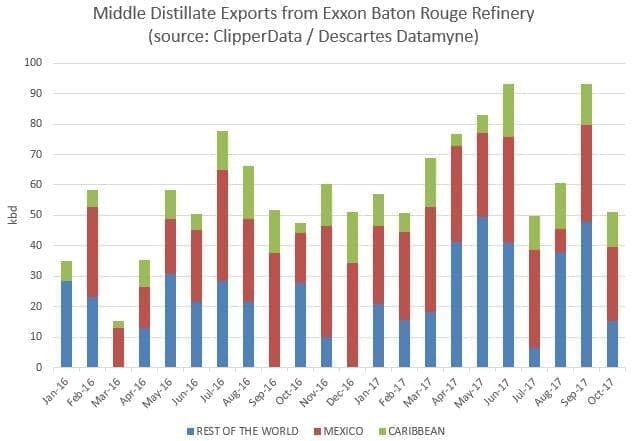 The Baton Rouge refinery is the third largest exporter of middle distillates on the U.S. Gulf Coast, behind Marathon's Garyville and Citgo's Corpus Christi refineries - sending out 70,000 bbls each day. 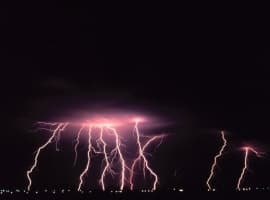 Of this volume, just over 40 percent of it has made its way to Mexico – down from just over 50 percent last year – while nearly 20 percent is heading to the Caribbean. 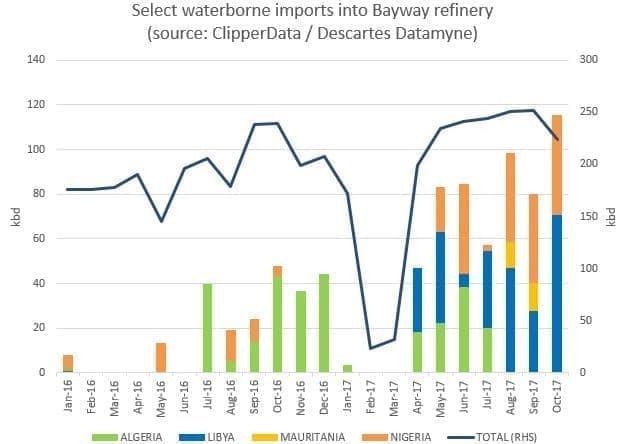 While it makes sense that the vast majority of exports are sent into Latin America and the Caribbean - given the proximity - we still see barrels heading into Europe, and countries including Denmark, France, Spain and Sweden this year. This serves to underscore the growing prominence of the U.S. as a powerhouse in the global export market. My travels this month started with a trip to Dallas. Texas is always a great place to visit; the people are so proud of their state - even more so amid the state’s resilient response to Hurricane Harvey. Texas accounts for a little over half of US gasoline exports, with loadings averaging just a shade below 500,000 bpd so far this year. Nonetheless, as refineries ramped back up again, exports from Texas ports have kicked higher in October, currently at the strongest pace for the year. At over 550,000 bpd, they are up 100,000 bpd from year-ago levels. 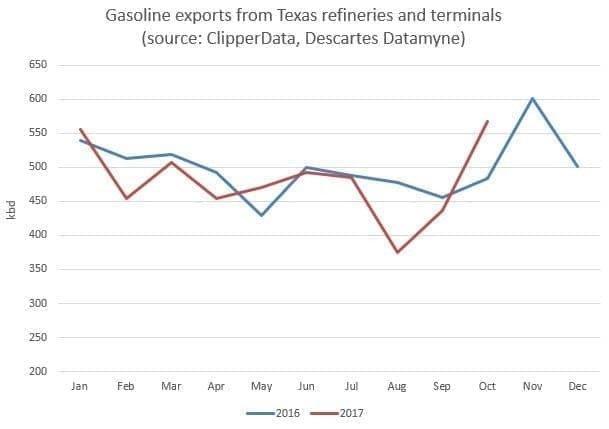 Given seasonality - in combination with strong refinery runs - we could / should see gasoline exports from Texan ports rise above 600,000 bpd in November. Finally, in the last week I was back in New York, one of my favorite cities. Within just a mile or two of Newark airport is Phillips 66' Bayway refinery. It is the northernmost refinery on the U.S. East Coast, and has refining capacity of 285,000 bpd.